COL David “Hack” Hackworth’s Legacy Foundation STAND FOR THE TROOPS (SFTT) aims to send our first cohort of 10 American Combat Veterans from MAJ Ben Richards’ Bronco Troop 1-14 CAV to Pocatello, Idaho for TREATMENT OF TEN, an innovative medical treatment protocol for Traumatic Brain Injury (TBI) and/or Post Traumatic Stress Disorder (PTSD). The cost for treatment, room and board for a two-month residential stay per Bronco soldier is $15,000; our goal is to send 10 Broncos for this life-saving multi-modality TREATMENT OF TEN program not offered by the US Department of Defense (DOD) or US Department of Veterans Affairs (VA). WE NEED YOUR SUPPORT to reach our $150,000 goal. A cutting-edge program integrating medical and wellness therapies that effectively treat the disabling “invisible wounds” of war, the TREATMENT OF TEN fundraising campaign kicks off on February 14 and runs until May 4, 2018, the 13th anniversary of Hack’s death and 20th anniversary of SFTT’s founding. 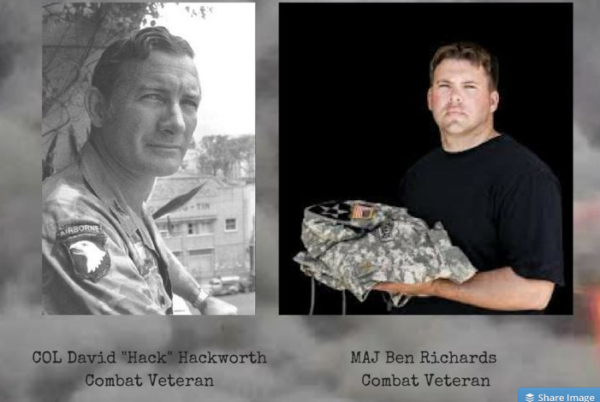 Richards and Hack are two warriors cut from the same khaki; they both risked their lives for the soldiers under their command and would do anything to expedite Combat Veterans’ recovery. Richards cites Hack’s determination to support his own troops in Vietnam as impetus for replicating this life-saving TREATMENT OF TEN program for Richards’ fellow Broncos. As a tribute to Hack’s legacy, SFTT embraces and endorses Richards’ TREATMENT OF TEN as the only comprehensive program of its kind of medical and alternative treatments for Veterans who are plagued by the repercussions of TBI and/or PTSD. Invisibly wounded warriors such as Richards and Hack who suffer from TBI and/or PTSD are 25 times more likely to commit suicide than their Veteran peers. So far, the VA and DOD have provided few effective treatment options at the national level for the majority of those afflicted with the physically and emotionally crippling side-effects of either brain trauma or PTSD. Now more than ever, there is an urgent need for innovative programs that are economically feasible, easily replicated and yield quantifiable results. The answer? SFTT’s TREATMENT OF TEN. Every treatment component of TREATMENT OF TEN has successfully demonstrated significant improvements in the symptoms of combat-related TBI and/or PTSD in scientifically-rigorous clinical trials as well as for Richards, who during combat operations in Iraq, sustained brain injuries after hitting IEDs (improvised explosive device) or being attacked by IED-laden vehicles. When he returned home incapacitated by the invisible wounds of TBI and/or PTSD, as did many in his unit, TREATMENT OF TEN enabled him to resume his role as attentive caretaker of his family. Hyperbaric Oxygen Therapy (HBOT) employs oxygen at greater than atmospheric pressure to treat basic disease processes. Since 2012, seven consecutive high-quality clinical trials have demonstrated the ability for HBOT to heal physical damage to the brain and reduce the symptoms of both TBI and/or PTSD in American Combat Veterans. individualized Transcranial Magnetic Stimulation (iTMS) directs short magnetic pulses to the area of the brain in need of stimulation to help synchronize the alpha waves and restore balanced brain wave activity. In a person whose brain activity has had its frequency disrupted by a physical or emotional trauma, the brain’s waves may appear imbalanced. Recent research has demonstrated the effectiveness of iTMS in reducing the symptoms of anxiety, depression, TBI, PTSD, and addiction, among other invisible injuries, plaguing many American Combat Veterans. Low-Level Light Therapy (LLLT), also commonly known as Photobiomodulation (PBM), is the application of light in the red and near-infrared wavelengths to stimulate and regenerate damaged or degenerating tissue. Recent research has demonstrated that transcranial applications can heal physical damage to the brain and reduce the symptoms of both TBI and/or PTSD in American Combat Veterans. Cranial Electrical Stimulation (CES) occurs when a patient, using an FDA-approved device, creates a modulated electrical current that helps the brain produce serotonin and other neurochemicals responsible for healthy mood and sleep. Proven safe and effective in multiple published studies, this therapy also alleviates the symptoms of depression, anxiety and insomnia plaguing many American Combat Veterans. Transcendental Meditation (TM) is a wellness therapy used to achieve a mental and physical relaxation that extends beyond the two daily 20-minute sessions when it’s practiced. Substantial research indicates that TM is among the most successful alternative wellness therapies (such as yoga, acupuncture, mindfulness training) in helping American Combat Veterans manage the symptoms of PTSD, anxiety, and depression. With your generosity, SFTT’s grass-roots effort to launch TREATMENT OF TEN will give American Combat Veterans a way out of the darkness that plagues them as civilians. A safe, proven and effective TBI and/or PTSD therapeutic program, TREATMENT OF TEN has helped Richards and promises to restore combat-disabled Veterans to “active duty” as spouses, parents, employees and engaged members of their communities. Your contributions will support Hack’s legacy and Ben’s commitment to leave no man behind. *NOTE: All TREATMENT OF TEN therapy providers are SFTT partners with a history of offering services such as service dog training, organic farming, equine therapy, hyperbaric treatment, Transcendental Meditation (TM), Low-Level Light/Laser Therapy (LLLT), individualized Transcranial Magnetic Stimulation (iTMS), and EEG Neurofeedback among other treatments, that improve the quality-of-life for Veterans and their families. Please DONATE and support SFTT’s campaign to help these 10 Broncos regain their lives.